Is BPO on the brink of a technology revolution? If you get a fleeting moment to wrench yourself away from your twitter feed, formatting that PowerPoint deck that's on its 18th cycle, or that excruciating conference call you are seriously not listening to, then you could do a lot worse that take a gander at our new report glamorously entitled, "BPO on the Brink of a New Generation: Technology Transformation". In order to attempt to capture your attention, even for said fleeting moment, we analyzed the performance of 189 BPO buyers and the role technology is, could, and will potentially play to help them achieve their desired business goals. "Technology Enabled Transformation" (28% of the market): Those BPO clients which have invested in a wide-scale technology transformation of their BPO processes. 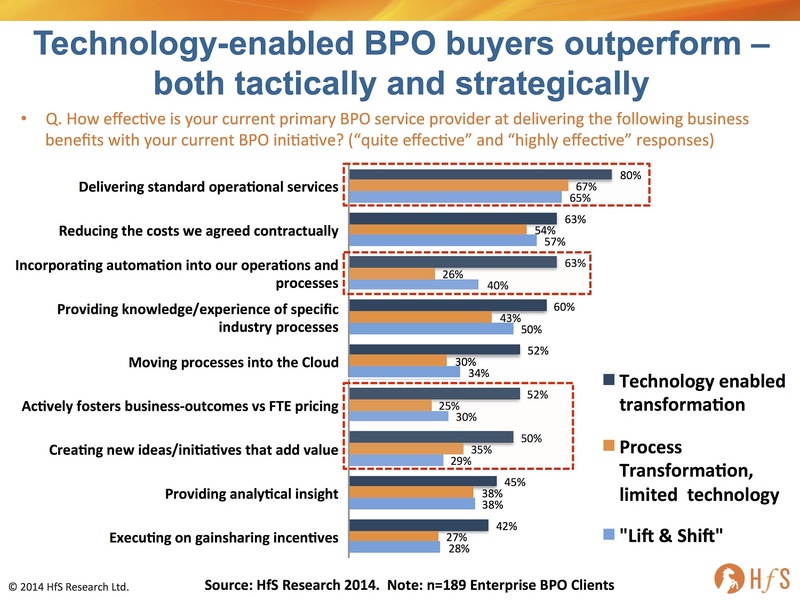 Firstly, those buyers with technology-enabled transformational BPO are reaping much better results from their standard services (80% view their engagements as quite to highly effective). This is indicative of the impact technology enablement can bring to standardizing processes and workflows that underpin process delivery and enable greater visibility and control for clients. According to one finance executive at a major media enterprise responsible for overseeing a finance and accounting BPO initiative, “Our provider implemented some workflow tools that enabled our accounts payable process to be fully automated. As a result, we’ve been able to reduce the amount of sub-tasks from 36 to 23, our payments cycle has sped up considerably, and we have much faster access to cash flow data and overall visibility over our processes.” As the chart above illustrates, automation capability is one of the areas that is vastly improved with technology enablement of process workflows (80% see real effectiveness). Technology clearly offers one of the fastest tracks to demonstrable improvement, in terms of ROI, with BPO engagements. 52% of buyers with technology-enabled BPO are seeing real progress towards shifting away from the “lift and shift” BPO model where the only value metric is based on cost per employee. This is twice the proportion of those clients which haven’t undergone technology-enablement of their BPO processes. According to the finance executive at the media firm, “since we renewed the contract, we now are paying for our accounts payable service purely by cost per invoice processed, we have greater visibility and predictability into our costs now”. Other BPO clients, still operating in less mature models without technology-enablement universally struggle to move away from the FTE model as they simply do not have the data and visibility of their transactions. 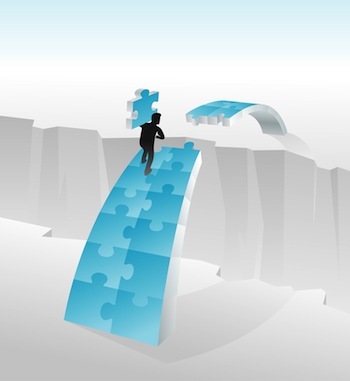 While some clients have embarked on some gainshare initiatives, for example offering incentives to their providers for speeding up their collections processes, or making greater savings from spend management, they have found it nigh-on impossible to develop the predictability of transaction volume without a strong technology underpinning. Another key factor in shifting away from an FTE model is to move processes into the cloud, which enables them to be universally accessible across an organization with one set of standards and workflows. Unsurprisingly, over half (52%) of the buyers who have undergone a technology transformation can boast effectiveness of process delivery in the cloud, which is a real driver behind shifting away from an FTE model. However, one key factor holding back many buyers is their heavy reliance on on-premise ERP which proves very cumbersome when it comes to cloud enabling many back office processes which are still mired in legacy software-based frameworks. “Our finance processes are so tied to our back-end data warehouses and our custom-built ERP that we’re years away from moving them to a cloud model”, stated one BPO client. However, HfS is seeing more progress moving HR process into the cloud, especially with many companies investing in Workday’s emerging HR platform. One client pointed out that “Workday has enabled us to unify our hire-to-retire processes across our North American operations is just a few months. Our provider has been able to help us implement the software and make rapid progress away from many of the manual processes we were relying on previously. Moving to a cloud model has enabled us to unify processes rapidly across manufacturing plants”. Most strikingly, technology-enabled BPO buyers are achieving real effectiveness in higher value areas, namely new ideas/initiatives (50%), analytical insight (45%) and even gainsharing with their providers (42%). While clearly there is room for improvement in these areas, it is notable how those buyers, which have invested in technology to enable their BPO, are able to focus on higher value outcomes. One major global hi-tech company has been working with its provider to develop a finance dashboard tool that helps provide real-time access to revenue cycle data. What is innovative about the initiative is that the provider is developing the tool at limited cost, with the agreement with the buyer that they can resell the tool to other clients when fully developed. HfS sees this as a genuine example of BPO gainsharing and innovation that adds significant value to both buyer and provider, and gives the buyer access to the best skills and expertise from their provider without paying exorbitant fees. Buyers and service providers need to re-think all of the existing "analog" steps processes which may currently be eased by technology but which aren't fundamentally digital in nature. The move to digital process platforms is inevitable as buyers and providers continue to search for ongoing savings, but it won't happen in the near term. The investment budgets of most BPO service providers remain too low to fuel digital innovation, while at the same time the majority of buyers and service providers still think in terms of FTEs more than process outcomes when contracting. Buyers also need to revamp their governance skills to cover these new capabilities, while many service providers need to invest in the higher caliber talent, analytics capabilities and technology platforms required to create this value. In short, the BPO industry’s ability to change is still slower than what buyers claim they want and expect, and what service providers claim they can actually deliver. Click here to read all related posts from the 2014 "Technology in BPO Study"
I absolutely agree with the article and having been engaged in deploying technology solutions to automate BPO processes for the last 15 years, I have been at the sharp end of the innovation curve. The first step is understanding your 'baseline' and being able to compare this against 'World Class Benchmarks' So having a platform that allows you to easily consume all the end to end metrics in near real time and then to compare the outcome of each initiative is an essential requirement. The gained transparency will allow for better dialogue between the service provider and the customer as both parties can see through a single lens all elements of the service and the outcomes that will be achieved through process change or the deployment of technology. The business case can be scrutinised before costs are incurred and by having a joined up view of the business both parties are able to support and demonstrate that the required levels of governance and compliance are being maintained. I would be happy to provide a deeper insight into how we are able to achieve this?